Since we added mono-stereo mode, please note that when you open sessions that were saved with v1.0.2, all mono instances of MOVEMENT will automatically be converted to mono-stereo instances of the plugin. This means that the output path of the track will now be stereo, and be aware that Pro Tools might automatically set the pan of the track’s left channel to center. This can easily be overcome by adjusting the left channel pan automation (of the track, not MOVEMENT) to be ‘<100.’ If you wish to continue using the mono version of the plugin, you can simply click on the MOVEMENT insert, hold and reselect MOVEMENT (mono) without losing any plugin settings. You should now be able to find MOVEMENT in your list of 32 bit AUs. In General, avoid using MOVEMENT within VE Pro itself, use MOVEMENT in your host DAW. VE Pro 5 has a hard time dealing with VST plugins that use a side-chain input (such as MOVEMENT). This issue is only pertaining to the VST format of the plugin, there are no such known issues with the AU version (Mac only) of MOVEMENT in VE Pro. Don’t be alarmed, this is not as serious as it might look and it only pertains to the VST version of MOVEMENT (not VST3). 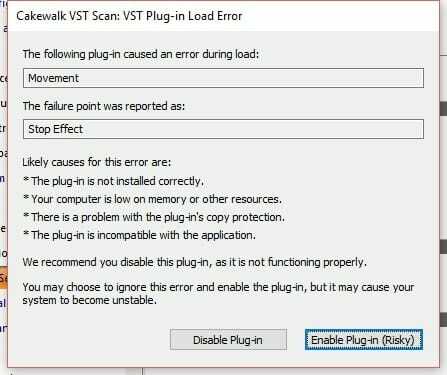 We’re still working out the fix for this error message, but in the meantime you can click ‘disable’ and use the VST3 version of MOVEMENT. When using MOVEMENT as an AU, you must assign a track to MOVEMENT’s sidechain input (within the DP plugin wrapper) to activate the main stereo outputs of the plugin. The assigned track can be a blank audio track, but MOVEMENT as an AU needs needs to have a source assigned to the sidechain input in DP8. This does not apply to VST versions of MOVEMENT in DP8. MOVEMENT now utilizes your machine’s Graphical Processing Unit (GPU) to handle the plugin’s motion graphics. If your GPU is not updated, you might experience graphical lags in your DAW, freezes, or other graphics related issues. Make sure to update your GPU to ensure optimal performance. If you use an AMD graphics processor, you might still notice high CPU, in which case please get in touch with us and we’ll send you an installer for a version of MOVEMENT that keeps motion graphics handled by the CPU.